Miss February is Angela 'Angel Baby' Sprinkles. Angela works in the cookie department of the bakery. No other elf decorates prettier Christmas cookies at the North Pole. She admits she is a fool for love and her favorite holiday after Christmas is Valentine's Day. Angela is an aficionado of 70's music and can be found spinning the vinyl under the great disco ball at the Aurora Club's Thursday Night Fever dance-a-thons. Her most prized possession is the album Robin Gibb's Favorite Christmas Carols. When asked to describe her dream elf she sang in her lovely voice: "If you like hot spiced cider, and getting caught in parades. If you're not into tofu, and you have your own sleigh. If you like sledding after midnight, on the hills by the lake. Then I'm the elf that you've looked for, write to me for a date." 28ct. 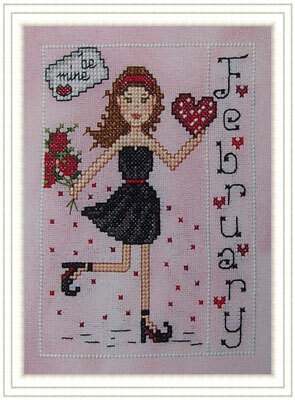 'Charm' lugana (stitched 2 over 2) from Picture This Plus.